La Vie en Rose apparently knows us all too well. We are obsessed with our glue gun, and not really big on having to sew things together. So, thanks to them, we are able to have toasty leg warmers - no sewing required. Yay! Glue gun lovers, this one is for you!! Instead of sewing them, I decided to glue it up this time around so those of you without the desire to stitch can still participate. Of course, you're welcome to sew them if you prefer. (1) Start it. Cut the sleeves off of an old sweater with a thick ribbed knit, so that it doesn't unravel. 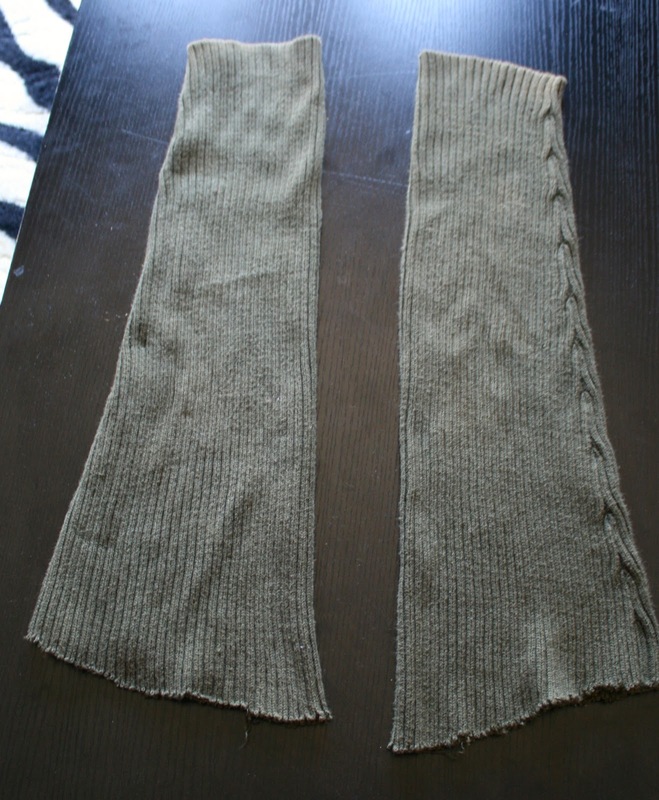 I cut these off of John's sweater *months* ago when I did the first post about legwarmers and they still haven't unraveled so I'd say it's safe. The end of the sleeve will be at the top of your knee and the underarm end will go down by your feet. (2) Cut it. Put them on and see if they're too long. If they are, mark down the right length and cut the excess off. Slit each one down the middle from top to bottom. If you *don't* want your legwarmers to be tapered and instead want them to be straight legged then fold them in half with the two cut ends together and cut the taper off from the TOP to BOTTOM so that they are now straight. (3) Ribbon it. Cut ribbon 2 inches longer than the legwarmer and in sections (so the glue doesn't dry), glue the ribbon on using fabric glue sticks in your gun (1/2 inch in from the edge). Tuck the ends over the other side and glue down at each end. (4) Connect it. Next, glue the ends back together. Put your glue down on the inside of the ribbon between the ribbon's edge and the edge of your legwarmer slit. Section by section, glue down the other edge. (5) Button it. 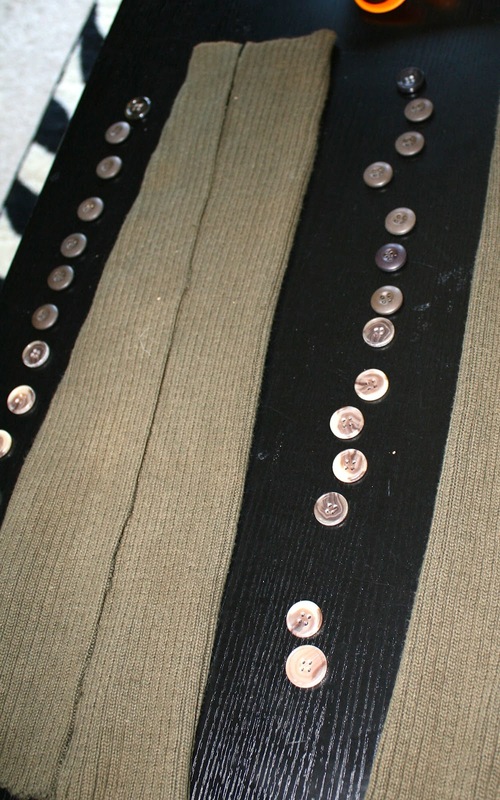 Place your buttons out into the exact way you'd like them and then one at a time, pick them up and glue them on. I like to apply the glue to the edges of the button so that it doesn't show through in the button holes. Be sure that the legwarmers match each other- you don't want one to have buttons going down much further than the other! (6) Wear it! I liked leaving my ends tapered. 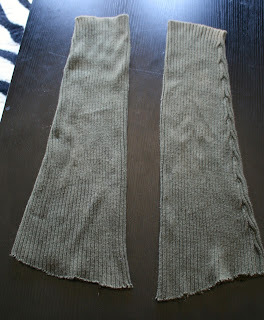 I think it looks interesting and different than regular legwarmers when worn with flats. It creates a flare shape. You can also wear them with boots, as pictured below. Forget expensive boot socks!